In 2013 as part of the Rainbow Scrap Challenge I made this wall quilt, Around About. I used the first few colours of the year and used some scraps to play. Each month a new colour was used. So Jan pink, Feb purple, March orange, and then green. When I got this far it felt done, but I was not sure so it sat. I got it quilted in time to have it in a quilt show the fall of 2015. I have this quilt listed as For Sale in my Art Quilts for Sale Page. 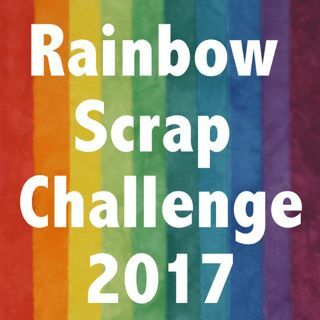 While this year Turquoise started the Rainbow Scrap Challenge 2017. I started a bit late but here is a start to a 2nd Time Around. I am hoping to use hand dyed fabric, solids and a few solid like batik fabrics. This way the piecing will show off more then if I used prints. Some of my scraps are cut nicely and some not so much. I will allow it to get a little wonky and try not to use a ruler to square up. Sometimes I just wack off a tail with my scissors. I work this on the design wall lots. I play with bits of fabric to see if it the next fit. February the colour is Purple so I have started to add a hint of purple. I have added a link to Design Wall Monday.